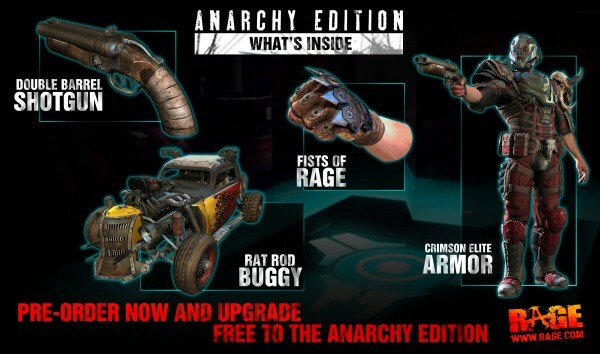 Pre-order your copy of Rage before October 7th and you’ll be glad to hear that your purchase will get automatically upgraded to the Anarchy Edition. Pre-orders are currently available from a selection of retailers including Amazon, HMV, GAME and GameStop with a release date of October 7, 2011 and will be available on PlayStation 3, Xbox 360 and PC. Must resist the urge to pre-order…..already bought 4 games in the last 2 weeks…..I cannot buy more yet!! Pre-Ordered from Game last night as Shopto was out of stock, just changed my order to Shopto as its cheaper and don't need the collectors edition rubbish. Their currently raging (get it?) over at RockPaperShotgun about bonus pre-order stuff in the game lol. Hmmm only a week to go and I really do want this game..
Ah well, might as well preorder it then.